Today’s global food system generates hunger alongside of land grabs, food waste, health problems, massive greenhouse gas emissions. Nora McKeon’s just-released book explains why we find ourselves in this situation and explores what we can do to change it. It opens with a brief review of how the international community (mis)managed food issues from WWII up to the time of the food price crisis of 2007-2008. It moves on to contrast the ways in which actors link up in corporate global food chains as compared to the local food webs that we think of as “alternative” but in fact feed most of the world’s population. It unpacks relevant paradigms – from productivism to food security and food sovereignty – and points out the perils of “scientific evidence-based” decision-making when it intrudes on the terrain that properly belongs to political process and value-based debate. The author highlights the significance of adopting a rights-based approach to solving food problems whereby adequate food is not simply a desirable outcome but an inalienable right that governments are obliged to ensure for their citizens. She describes how people around the world are organizing to protect their access to resources and build better ways of food provision and governance from the bottom up, in what is increasingly referred to as a food sovereignty movement. 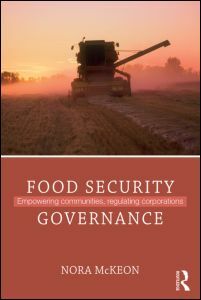 She discusses how the Committee on World Food Security – a uniquely inclusive global policy forum since its reform in 2009 – could be supportive of these efforts. The book concludes with a call to blow the whistle on speculative capitalism by building effective public policy instruments for accountable governance and extending their authority to the realm of regulating markets and corporations. To obtain a 20% discount visit the book’s page on the Routledge website www.routledge.com/9780415529105 and enter the code FDC20 at check-out. Posted on March 21, 2015 March 21, 2015 by foodgovernancePosted in CFS, Food Policy, Food Security, Food Sovereignty, Food Studies, Global Food Governance, Participation in PolicyTagged CFS, CSM, Food Policy, Food Security.